I came across wheat noodle and buckwheat noodle containing akamoku powder at a store in the government-managed park Michinoku-Koen located in Kawasaki, Miyagi. Akamoku is a kind of large, sticky seaweed. Akamoku recently draws attention as healthy food that contains dietary fibers, fucoidan, algin acid, polyphenol etc. smell of ocean, umami (the 5th taste sensation) of seaweed and new smooth texture. 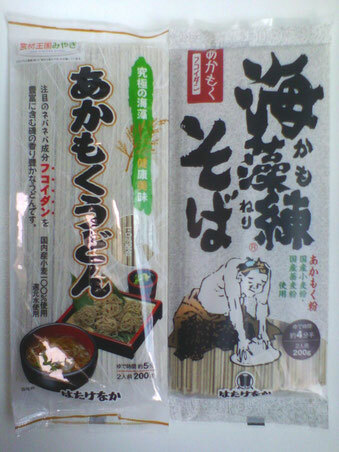 Each 200g-package contains about 20g of raw akamoku equivalent.